Note: As of 4:40 pm Friday Bangkok time, I’m revising this entry from the original three killed to only one, based on updated reports being released by local news media. 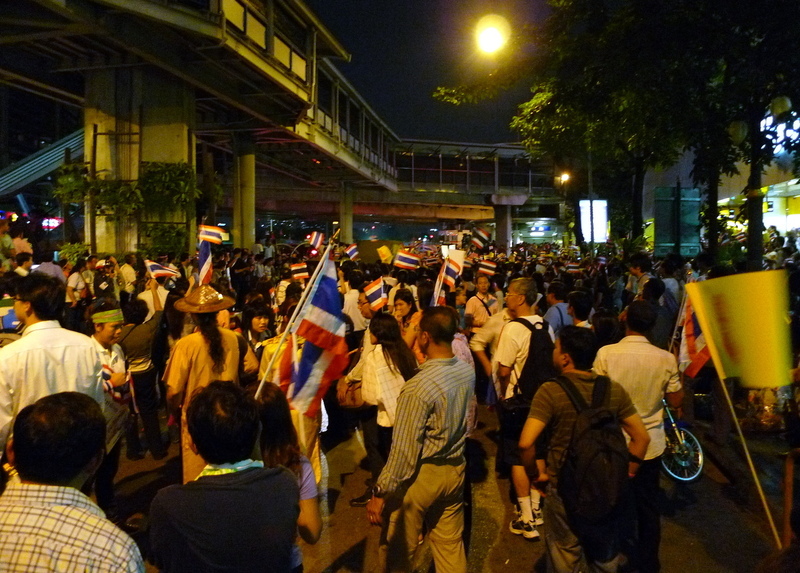 The political situation in Bangkok continues to heat up. In the past few days, counter protests (pro-government groups who are against the Red Shirts, but are not necessarily part of the Yellow Shirt movement) have formed in the Silom business district. These protests are ostensibly formed of office workers, business owners, and others who oppose the Red Shirts’ desire to spread their protest into this business district. Before heading to the Foreign Correspondents’ Club to listen to a panel discussion about the future of politics in Thailand, I headed to Silom to take some pictures and see what the protests looked like. I have learned my lesson, though, to heed the warnings from the US State Department. 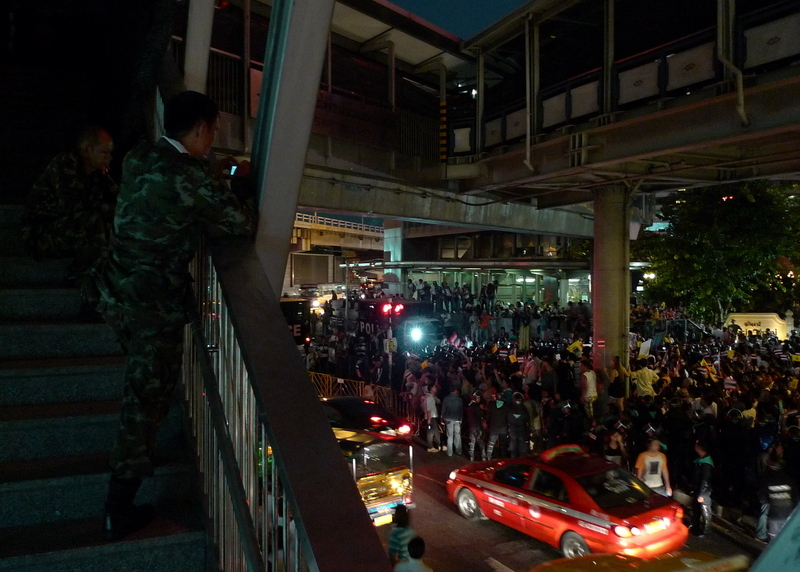 An hour after I left the area, five four M97 grenades were launched (ostensibly from the Red Shirts demonstration area) into the “No Color Shirts” crowd, killing three one. This happened in exactly the area I had been filming and taking pictures. This map shows you the affected area. The Red Shirts have set up an encampment in the plaza in front of Lumpini Park. They have also established an impressive barricade made of tires, concrete blocks, and sharpened bamboo sticks, effectively cutting off Ratchadamri Road at Rama IV. Note: As of 4:40 pm today local time, both police and Red Shirts have agreed to back off from their respective positions 100 meters (300 feet) today to help lower tensions at that particular location. 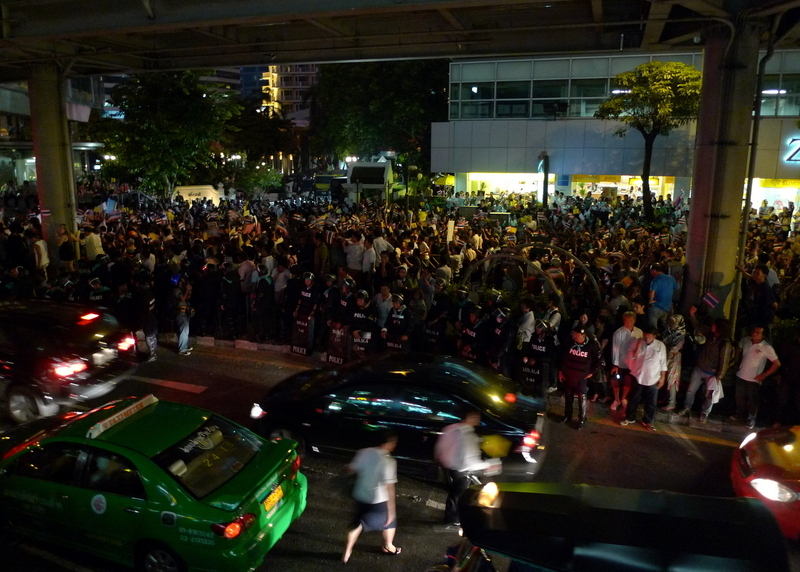 Crowd along the south side of Silom Road. 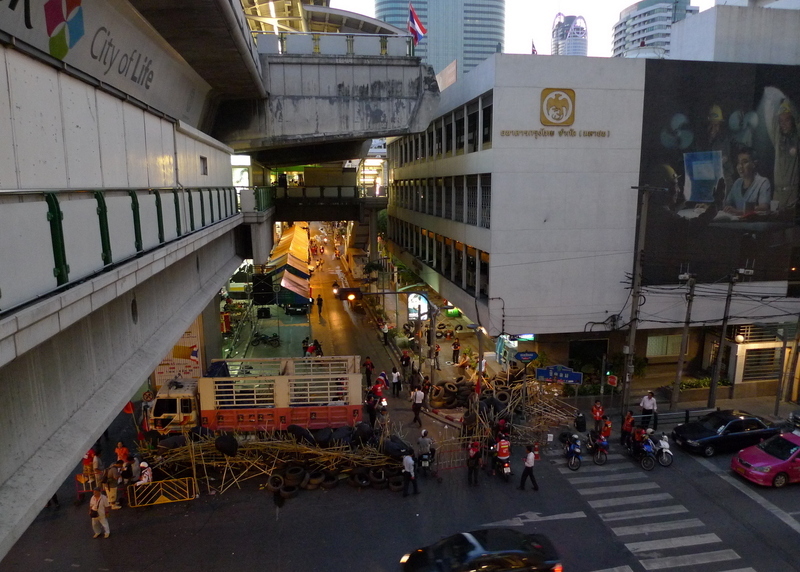 The elevated walkway connects the Saladaeng BTS Skytrain station to the Silom subway station. The soldiers have closed the walkway, hung black tarp to obscure their movements, and are stations above the crowd. Police officers in riot gear try to keep crowds on the sidewalk so traffic can continue to move. There were about 1,000 “No Color Shirts” and probably 500 police and army troops in the area. The police vans are in the picture are at the middle of the intersection. The Red Shirts’ barricade is behind the vans. 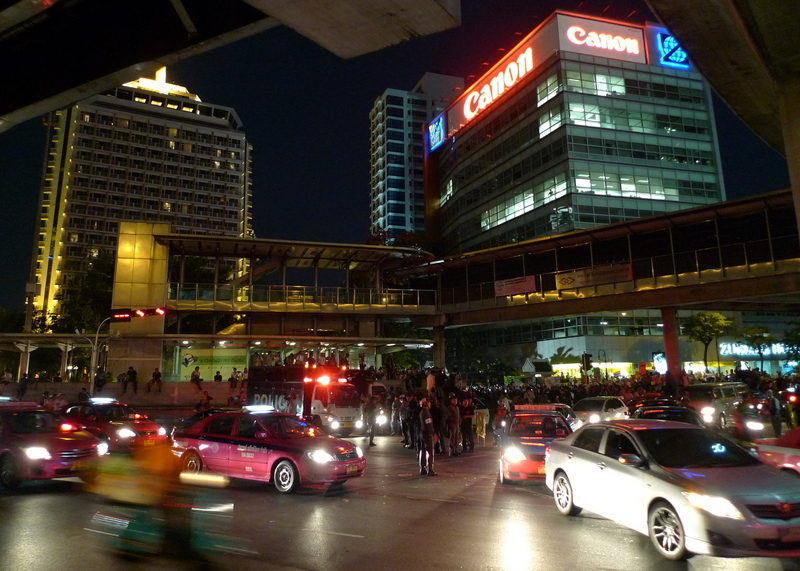 From the median in Rama IV road looking back towards Silom Road. The Dusit Thani Hotel is on the left – the first “high rise” in Bangkok, decades ago. Soldiers take pictures of the crowd. There was a row of razor wire immediately to my left between me and the soldier. Back at Chidlom Road, the Red Shirts have erected barricades and are carefully checking any vehicles coming into their protest area. I returned to the Chidlom area where the Foreign Correspondents’ Club is located about 7:30 and met with Ken for a quick bite at the only place open – McDonalds – before heading to the club. The audience for the panel was standing room only. There were four panelists: the head doctor of the BMA Hospital, which received the majority of cases after the April 10th confrontation between the soldiers and Red Shirts; the ambassador from Sweden; and two academics, one who spoke of the history of political protests in Thailand and the second of whom is part of an organization working to mediate the situation and arrive at a workable, peaceful solution. The doctor shared a summary of casualties from the protests and showed forensic pictures of the “hard object” wounds. Quite gruesome. There is a lot of debate between the “committee” that has been formed to review the forensic evidence from the April 10th events, with printed rumors that the head forensic specialist disagrees with the committee’s conclusion. The doctor himself was very careful to avoid drawing any conclusions, even when pressed during the questioning by journalists. In fact, he wouldn’t state how many deaths were caused by bullets, perfering only to classify them as “death by hard object”. I sense that there are bigger powers struggling to prevent the release of this information. The speculation of one journalist was that based on the photos of the wounds to the Japanese photojournalist who died, he may have been hit by a rooftop sniper. No comment by the doctor. The ambassador spoke unofficially representing the opinion of the global diplomatic community, expressing his concern that whereas the Thais have managed time and time again to pull themselves back from the brink of political disaster, that this time things may have gone too far and become too escalated to result in a peaceful outcome. Nonetheless, he expressed his hope that for the Thai people’s benefit, a peaceful, negotiated settlement occurs. The historian compared this current political situation with previous protests that ended in violence in 1973, 1976, and 1992. The biggest thing that distinguishes this movement, which he feels started with the coup in September 2006, is that the rank-and-file members of the Red Shirts represent a first-ever truly widespread popular political uprising. His opinion is that in the past, people who showed up at protests, etc. were either just a few ideological individuals or large masses of mostly paid pawns. This time, he feels there is some legitimate self-concern and sense of empowerment by the members of the Red Shirt protests. His big question is, even if the Red Shirts win the conflict, will they be able to effectively govern this new, politically aware class of citizens? The negotiator has been working over the past six weeks to secure a peaceful settlement between all sides in the conflict. He differed with the historian, identifying former Prime Minister Thaksin’s sale of his company, Shin Corp, to Tamasek, the Singaporean sovereign wealthy fund, as the real starting point of this current conflict. (You may recall that this sale, on which Thaksin and others made a huge sum of tax-free money) led to protests calling for his resignation, ultimately leading up to the coup. The negotiator explained that the major parties have agreed in principle to a five point settlement: Dissolution of the House in five months; Free and fair elections; Acceptance of the election results; Respect for the rule of law – court verdicts, peace and order, etc. will be respected; an independent commission to look into the events of April 10. The problem, he explained, is that neither side is willing to be the first to accept the terms, for fear of “losing face” and looking like the loser. So where does that lead us? It is Friday afternoon. There is widespread speculation that the government will make a move to clear out the protesters before the weekend is over. 60,000 additional troops have been brought in from the south. The BTS Skytrain is closing operations at 6pm tonight – bear in mind today is a payday so normally people are out and about spending their monthly salary. All signs point to a bad weekend here in Bangkok. Let’s hope the negotiations work. 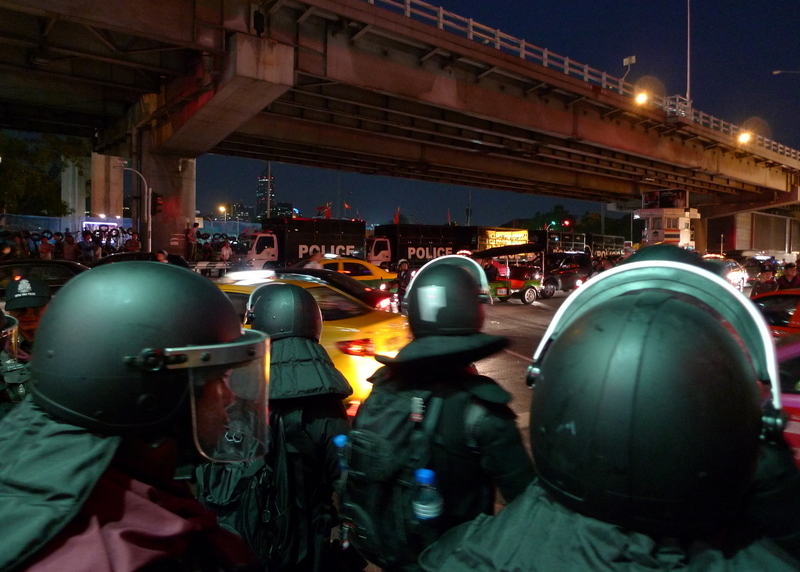 This entry was posted in Uncategorized and tagged Bangkok, Krungthep, politics, Protests, Red Shirts, Silom, Thailand, UDD by christao408. Bookmark the permalink. Sad news……true, hope the negotiations will work!! You are lucky to leave early to avoid the blast! I was at the Paragon Mall in New Year’s Eve of 2006, and there was a bomb threat. So, everyone had to exit the mall early at 9pm. That was scary. And I can imagine how chaotic it must be at the Saladeng Station before and after the blast. And I guess the hot climate does not help too.Let’s hope both parties keep a cool head and back on the negotiating table. Violence and deadly force should not be a solution for indifferences. Stay safe! I hope they will somehow find a path out of this. I worry that each side’s positions have become too entrenched. I hope you and Tawn remain safe and that your blog doesn’t get censored. Wow, I hope that negotiations work. I hope also that you and Tawn stay safe! Thank you for your fresh perspective Chris. It’s difficult to know what is really happening in Southeast Asia as the news here do not cover them.I hope you and Tawn, and those dear to both of you, stay safe and away from harm.And I hope there’s a peaceful outcome to all of this chaos soon. Very interesting to hear (and see!) the issues from a local perspective. Thanks for posting. Okay! Stay home and watch it on television! Your safety is so much more important than giving us up to the minute info. This is getting very very scary. And I am a child of the sixties where protests were part of our day all the time. I echo the above! It really makes me nervous. Be safe! I hope all this is resolved without more bloodshed. But I’m an optimist. wow i didn’t even know all this was this serious – my ignorance.yes stay safe!! As I read the post, all I could think was hope you and Tawn stay safe! I can’t even imagine how it would be to be there. You definitely shouldn’t take any risks to go and get photos!! Hope everything ends well for everyone! That is scary and dangerous! Although I am hoping for a peaceful negotiation, I have deep concern. It seems the army has a kind of divided opinion within the ranks. I read that, unlike before, there are “watermellon” troops, that is, green outside but red inside. Also the goverment refused the Red Shirt’s demands yesterday. Those are signs pointing to a possible coup or crack down, and some people will be getting killed. It is so sad. Hope things will work out peacefully; and you and Tawn safe and sound. Building on what Matt said, please choose your words carefully here as I suspect that someone in the government maybe monitoring. @stevew918 – @ElusiveWords – Knowing that lese majeste laws are strictly enforced, I choose my words very carefully and make every effort at reporting political news in Thailand with as much objectivity as I can muster. @bejewel07 – One thing I’ve learned from first-hand experience is to consider that the media’s coverage of events rarely goes into appreciable depth. This is true in terms of how the Thailand crisis is being covered in the west as well as how pretty much anything else is covered anywhere else. Audiences don’t have enough attention for in-depth stories about everything, I guess. @Redlegsix – I’m pretty sure the old weekend market was held up at Sanam Luang. 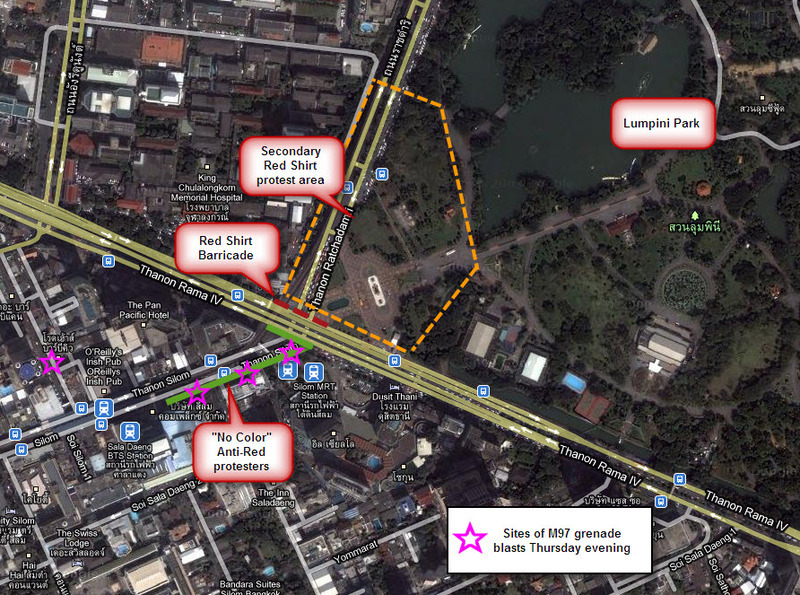 That is considerably far away from the Lumphini Park area. Unless I’m mistaken and the weekend market was held elsewhere. @wolf__parties – A protest in Switzerland? Sounds like something that would never happen there! Chris, How do you insert these text boxes in Google maps, e.g., “Secondary Red Shirt protest area”? @beowulf222 – I use a program called SnagIt by TechSmith. http://www.techsmith.com/screen-capture.asp It is one of the most useful programs and I use it for work (capturing screen shots and annotating them) almost on a daily basis.